There is nothing quite so useless as doing with great efficiency, something that should not be at all. These words of Peter Drucker, unfortunately, are still very true. Here at SolveQ, we have seen many projects that made no real impact on the business. It was the more painful that highly educated and well-paid people were spending time working on those. At SolveQ we put our best efforts to solve with the best quality problems of our clients. The first question oftentimes is where the problem lies and what solution would give the most desirable results. Software development is learning process, working code is side effect. We couldn’t have expressed it better than Antonio Brandolini in the quote above. Taking a closer look at how software is created, one may notice that a big part of the process is reading and discussing. That is why we value and often emphasize the discovery phase of product development. At this stage, we strive to understand the business of our client and the problem that brings him the biggest pain. One has to understand the problem in front of him in order to deliver the right solution. Therefore it is not a surprise that in our toolbelt we have many tools aimed at getting the problem right. In this post, we want to start with showing you tools that help our customers spend the money on the things that could bring the biggest gain. Impact mapping is a strategic planning technique. It prevents organisations from getting lost while building products and delivering projects, by clearly communicating assumptions, helping teams align their activities with overall business objectives and make better roadmap decisions. This excerpt from Impact Mapping website gives the why that inspired Gojko Adzic when he came up with this tool. The process is so simple that it can be wrapped up in a 5-minute video, like the one published by SkyScanner. The first step is to define the goal you want to reach in your business. A goal that tells us why are we putting our effort in at all. Best goals are those that we know how to measure. It is important to define the starting and target value, and a time period for the change to occur. Once the goal is known, think of whose behaviour change would help us achieve the goal. It could be personas you have defined in your business model. But don’t forget also the distractors, people whose behaviour will act against your goal. Changing their behaviour can have even greater impact. Knowing whose behaviour we want to change, it is time to define, how do we want to change it. That is the moment when you define the impact you want to have on the actors. The three steps so far were covering our sphere of influence. We have no control over whether the goal will be achieved or not. As we don’t have control over the behaviours of the actors. What we can do is make bets on what deliverable would change the behaviour. Bets on that change of behaviour will affect the metrics measuring how far we are from our goal. Therefore almost the last thing you will do is defining deliverables. These deliverables will be the work your team will put an effort in. 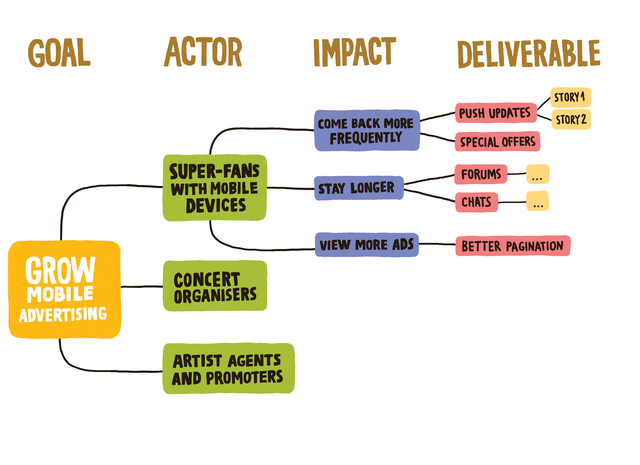 Impact maps are easily drawn as mind maps. All those parts of the map are linked by assumptions. You make an assumption that given deliverable will impact the behaviour of given actor. That as a result will help you achieve the stated goal. Choose which of the assumptions you want to test. Pick the most probable and those that would give you the biggest impact on the value you want to change. That is where your work should focus on in first place. It will be no surprise to find along the way, that the goal was achieved without applying all the impacts. You may also find many deliverables abandoned because the assumed impact was not achieved or the impact did not affected the goal. That is where this process helps you save money. Both by not building all the ideas you had in first place, but also dropping the maintenance of the deliverables which did no good or even made things worse. If you want to embark on the journey of building a software-based product, better get prepared. And this journey is the more pleasant, the more you can rely on your partners to spend your money wisely. The metrics should measure how close are you to reach your goal, not how busy the development team was. And Impact Mapping is in our opinion great tool to get a good view of whether what we are building for our client is getting him closer to the prize. To get better and deeper understanding of the purpose of this workshop I also recommend the following talk by the author of the method, Gojko Adzic.